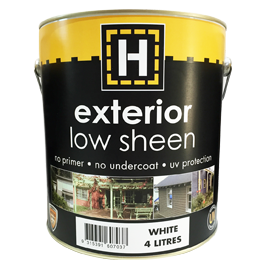 H-brand exterior low sheen is a tough 100% acrylic architectural paint specially formulated to protect against the harsh Australian climate. As well as containing Zinc Oxide and other U.V. blockouts, it is better able to expand with heat and contract when cold, than ordinary paints. Weatherboard, pergolas, picket fences, rails, plasterboard, particleboard, MDF, galvanised iron and other rust resisting metals, fibro and masonry. It is not recommended for contact surfaces such as windows, doors or trim, furniture, shelves or wrought iron. These are best painted with H-brand gloss or satin trim. Available in White and Tint Bases which are compatible with all major tinting systems. Tinter, if added, should be shaken or stirred in thoroughly immediately after addition. Sizes 500mL, 1 litre, 4 litre, 10 litre and 15 litre. Coverage A maximum coverage rate of 14m² per Litre per coat. This may fall below 10m² per litre when painting corrugated, rough or absorbent surfaces.